Standard weight polypropylene means durable storage for documents and reference materials. Acid-free protection with polypropylene means no photocopy transfer. 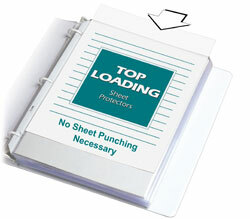 Top loading sheet protectors provides permanent storage for your materials. No sheet punching is necessary thereby keeping your documents in their original condition. A4 Size. Clear finish. 50/BX.